The East Coast’s Notorious B.I.G.. The West Coast’s Tupac Shakur. For all the hip-hop fans out there, these are the names of two of the greatest emcee’s to ever touch a microphone. Later on, the South developed a unique style thanks to artists like Outkast. The Midwest finally got attention when artists like Nelly and Kanye West entered the scene because they had a style that was unheard of by all hip-hop lovers. For years, artists have been influenced by the styles of their favorite artists, and the Midwest in particular is considered to be a melting pot of styles to which today’s Midwestern rappers contribute. Cities like Los Angeles and New York City already have established rap scenes because the hip-hop culture has existed there for years. Hip-hop artists from the Midwest struggle to find an identity because there isn’t a distinct style that defines the Midwest. This is partially due to the fact that the demand for hip-hop was in highly-populated cities in the East, West, and South. Now that the Midwest has a solid structure for hip-hop, local artists are finding new ways to craft their music, while still being influenced by A-list rappers from all corners of the United States. One of the biggest new names coming out of the Midwest is Chicago native Chance the Rapper. The 23-year-old rapper, who has only put out free mixtapes in the past, found his own unique sound to add to Chicago’s already-segmented rap scene. His love for Christian faith, the positive lyrics and the uplifting gospel elements in his music have almost created another sub-genre within hip-hop for music lovers. 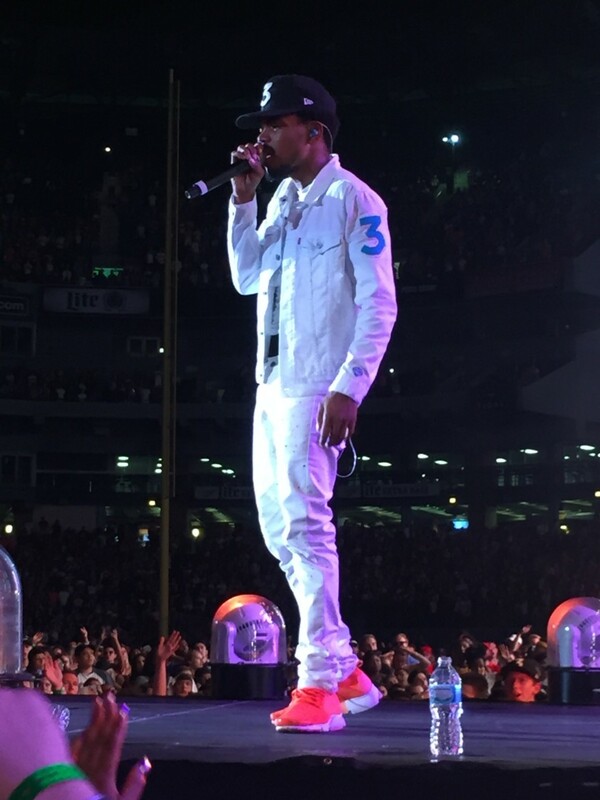 Chance the Rapper performing in U.S. Cellular field (photo courtesy of Luke Landry). Chance the Rapper follows in the footsteps of his Chicago predecessor and longtime idol Kanye West with styles that mimic West’s ‘feel good,’ up-tempo discography. Also from the Windy City, West created his sound by sampling soulful records from the 1970s and 1980s. It was something that the rap world had never really heard before, and Chance has made a similar impact blending gospel and hip-hop into its own genre. Below you can listen to “All We Got” by Chance the Rapper and notice the gospel elements and soulful choir harmonizing throughout the record. This track can be heard on Chance’s Grammy-winning mixtape, Coloring Book. Some rappers choose to use a style of hip-hop that is uncommon in their part of the country. An example of this is Cram, a local hip-hop group from the Twin Cities region of Minnesota. Most of their discography uses heavy instrumentation and dark, experimental lyrics, similar to the type of music coming out of the East Coast. They have been compared to the famous East Coast rap group Wu-Tang Clan for their rare uniform beats. Listen to “Trenches (In & Out the Hood)” by Cram and focus on some of the dark lyrics the group recites over a bass-heavy, looped beat. To compare, in “Visionz” by Wu-Tang Clan you can hear some of the same features Cram uses. Listen to both songs below. There are some cities in the Midwest that don’t have much of a hip-hop scene at all. However, local hip-hop artists from there still want to show off their talent, even if it take a little longer. Des Moines rapper Carlos Devone believes his city is full of entrepreneurial spirit, but it’s not too big to where some music can quickly become saturated. “The thing I love about Des Moines is that there are so many entrepreneurs around, so you’re able to feel the fire of starting something new,” Devone says. Devone, along with other artists in Des Moines, might not get the exposure of a big city like Chicago, but a smaller city also means less competition in your hometown. Carlos performing at his CD signing in 2016 (photo courtesy of Jay D Morales). 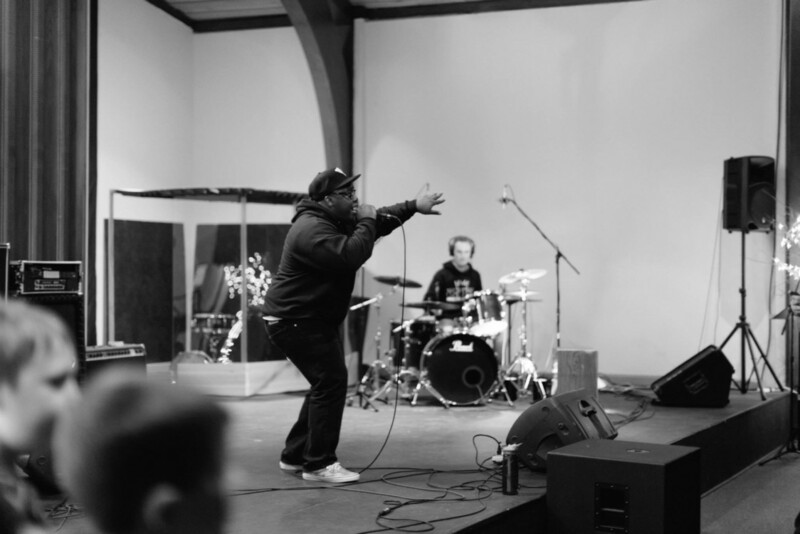 Originally from Jacksonville, Florida, Devone brought his Southern hip-hop roots to Iowa after working at a nonprofit at the University of Iowa. Several years later, he moved to Des Moines to be in a bigger city in hopes of sparking his music career. Devone uses a balance of alternative hip-hop beats and live instrumentation, switching back and forth between harmonizing and rapping. He explained how Outkast has influenced him to create music that is different but relevant. “Outkast was for sure one of my favorite because they created music ahead of their time, but people could still relate to,” Devone said. Although Outkast was from Atlanta, the duo also created a unique sound by rapping and singing to hip-hop beats. Listen to “Won’t Take My Soul” off Carlos Devone’s mini-album, The Soul Collective. Naturally, aspiring rappers are mainly going to be influenced by the music they listened to while growing up. Whether in big or small quantities, these musical influences are seen in up-and-coming artists all over the country. While technically considered to be in the Midwest, Oklahoma City rapper Phan the Konnect Man considers his style to be more representative of the South. “As one of the frontliners for Oklahoma City hip-hop, I have found that the South has influenced a lot of Midwestern artists like me because it’s the trend for Midwestern rappers these days,” Phan said. The heavy bass, ghetto slang, and catchy hooks is what the Southern sound is all about, and Phan represents it well in songs like “OMW” off his 2016 album, It’s Gon Be a Fee. Give it a listen below. Many rappers like Phan rap over the fast, hard-hitting instrumentals found in the ‘club bangers’ currently produced by artists in the South. History shows that rappers from the Midwest have the power to originate their own style, but also draw from musical trends that emerge in other regions of the country. Artists who strive to make new music coming out of the Midwest all help move the hip-hop culture forward, but it’s important to see how these sounds have originated and evolved throughout the course of this genre. 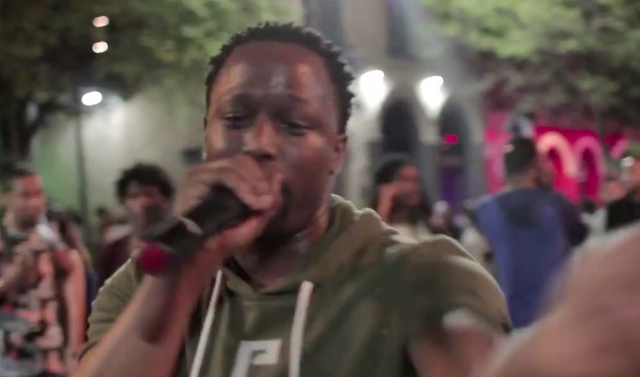 Phan The Konnect Man performing at South By Southwest festival in Austin, Texas (photo courtesy of Rahsaan Ray). A lot of rap enthusiasts have trouble pinpointing exactly what the Midwest sound is like. The sound of hip-hop in Midwestern cities grabs and samples music from many other styles and genres in the U.S., and new artists are continuing with this trend. 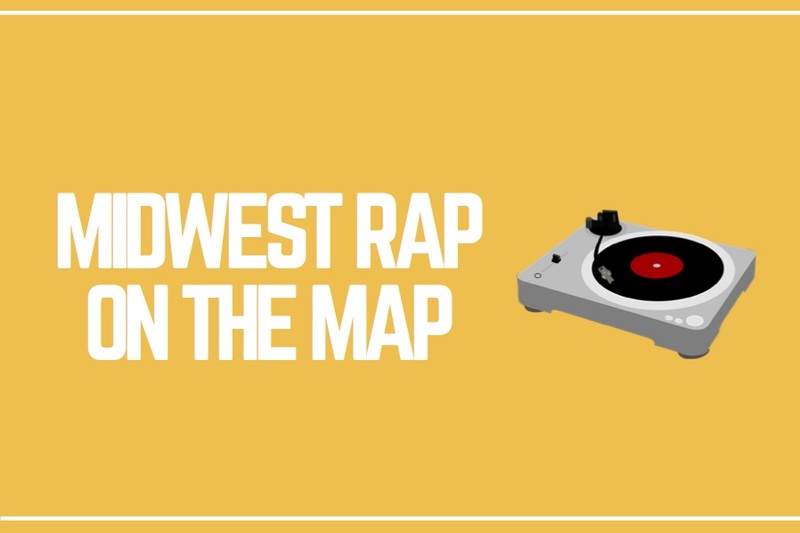 While some claim that Midwest sound lacks originality, many argue it shows the influence that the previous generation of rappers can have on newer artists. Social media platforms have made it even easier for new hip-hop artists to put their name on the map because their name is quickly exposed to millions of music listeners. Platforms like Facebook and Twitter offer a space for new artists to share their story and market their music which helps add to the innovative hip-hop culture.